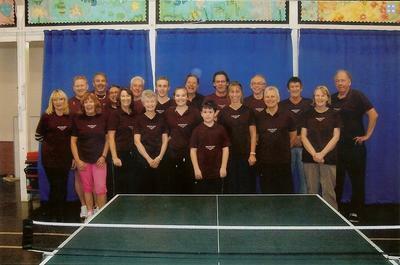 Hockley Table Tennis Club is in England, situated in South-East Essex, about 10 minutes away from Southend-on-Sea. The club was formed in 2009, when there was one team of three juniors, with Trevor (the founder of the club) and one of the dads making up the organisation. Since then, two tables have grown to seven, five members have become 31, and the club has relocated to much larger premises. The club is expanding at a rapid pace, but at the same time, we are keen to stick to our roots, and operate predominantly as a social club, rather than a competitive club, although the competitive side will forever be present for those who wish to explore it. Visitors are more than welcome to come along on a club night to play some fun, social table tennis, with the first session completely free. After that it costs just £3 for adults and £2 for juniors/cadets after registration, per week. The club has its club night every Thursday from 19:30 - 22:00, and has junior training from 18:00 - 19:00. The junior coaching sessions are held by the clubs specialist head of youth development coach, and so places are limited. Therefore, it is probably best to contact Trevor before attending these sessions. The club currently has seven table tennis tables, including one Butterfly Europa match table that is kept for home fixtures only. The club has also recently purchased a storage facility, so that all of our tables can stay protected from general damage when they are not in use. The club itself is based in the biggest hall on the primary school site. There is plenty of space in the hall for the number of members that attend club nights each week, and is well lit, with good ventilation and has the facility to cordon off sections for matches. The club is forever expanding, but currently has 31 members, all of which play at different standards, so any new members are welcome, whether you're a seasoned professional, or picking up a bat for the first time. The club has 5 teams in 3 divisions within the Southend District Table Tennis League, from a beginner level to an advanced level. As well as participating in the winter league, the club also enters teams for the handicapped competition and summer league, and players are always encouraged to enter the league championships at the end of the season. However, if you would much rather just play socially, then that isn't a problem at all. The table to player ratio means that all members can get as much game time as they want. The club also combines training and socialising, so that players are getting practice on the night, but are enjoying it while they do it. As explained, the club offers junior coaching in one hour sessions once a week, given by the head junior coach to varying group sizes. The club has also started adult coaching, which takes place on club nights, operating on a weekly team rotation. Visitors can contact either Trevor Vincent on 07828 175493 or Josh Copeland on 07756 899677. Contact forms are also available on our website.